Q: What made you interested in adverting? A: I wasn’t really all that interested in advertising until I was approached by an ad agency to score some music for their toy commercial. Then another agency asked me to write and produce a Radio spot for one of their clients and I enjoyed the process. Q: How did you go about establishing your business? A: I compiled about half a dozen commercials that I’d produced for a couple of agencies, moved to Los Angeles and began pounding the pavement, getting in touch with as many ad agencies in L.A. as I could. Q: What are some of the differences between a good radio ad and a good TV ad? A: Not much, other than pictures and great graphics. Great Radio paints a picture—it’s the Theater of the Mind—and great TV also tells a story well. The biggest difference is in the voice talent. TV V-Os don’t have to work as hard as Radio sometimes, because the pictures are there to carry the emotion. The sad fact is that most advertisers today don’t care about using creative Radio advertising. They’d rather use boilerplate copy or hackneyed ideas to tout their product, using station announcers to trumpet their products rather than attempt to entertain and inform potential customers. A: Creating a musical theme for the Make-A-Wish Foundation. Finding an uplifting message about terminally ill children getting their last wish granted was a toughie. 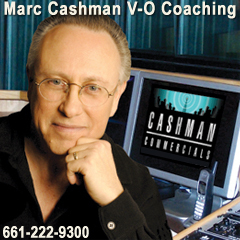 You can hear it on my website (www.cashmancommercials.com) on the “Radio Spots” button. Q: What kind of things do you work on as a voice over instruction coach? A: I teach virtually all genres of voiceover and voice acting: commercials, narration, promos, trailers, e-Learning, animation, videogames and audiobooks. I also teach people the skills they need to be able to compete in these areas, as well as the business side of V-O. I teach private classes, do one-on-one coaching via Skype, and instruct at the undergraduate and graduate level at California Institute of the Arts (CalArts). Q: What has been your greatest triumph to date? A: Raising a healthy, adjusted child. But as far as a career triumph, there’s not one project in particular, but a series of projects I’ve been involved in over the years—public service spots. PSAs are the only area of Radio advertising that don’t sell crap, but actually contributes to the social welfare. And I do it for free. Q: How can an aspiring voice over actor best promote him or herself? A: There are myriad avenues/platforms for self-promotion today: LinkedIn, Facebook, email blasts through Constant Contact or Mail Chimp, direct mail campaigns (they’re making a comeback! ), etc. The smartest thing to do is to build a contact/work database and keep prospective contacts constantly top of mind—without making a pest of yourself. Q: Who do you think was the greatest voice over actor or emcee in the history of TV or radio? A: Don La Fontaine has been touted as the King of Voiceover, but he was known primarily for his work in movie trailers and promos. In my opinion, the greatest voice actor of the 20th century was Mel Blanc—the voice of dozens of memorable cartoon characters. In the 21st century, my nomination is Seth McFarland—a true voice acting genius. A: I would refuse almost any political ad for a politician (with the exception of a Democratic nominee for President or Governor), any company that’s been involved in despoiling the environment (Exxon, BP, Monsanto, etc. ), or any religious organization, unless they’re sponsoring help for the homeless or hungry.